Professor Ian Godwin has over 30 years’ experience in plant biotechnology research, first undertaking sugar beet genetic engineering at Birmingham University in the UK in the 1980s. 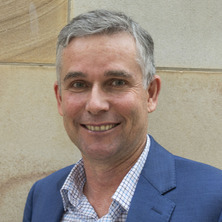 He joined UQ in 1990, holding an academic position in plant molecular genetics. In 2019 he joined QAAFI as Director of the Centre for Crop Science. He leads research in the use of biotechnological tools for crop improvement, with emphasis on the sustainable production of grain crops. Major focus is on the improvement of crops for food, feed and bio-industrial end-uses. He has pioneered the use of GM and gene edited techniques in sorghum. Research projects include international collaborations with a focus on food security and plant genetic resource conservation with collaborators in Germany, Denmark, the United States, China, Ethiopia and Pacific Island countries. He is passionate about the public communication of science, and has spoken at many public events on genetics, GM plants and food, animal cloning, and the future of agriculture in a changing climate. In 2003 he was an ABC Science Media Fellow, and has appeared on ABC and BBC radio on numerous occasions. His popular science book Good Enough to Eat? : Next Generation GM Crops was published by the Royal Society of Chemistry in 2019. Genetic improvement of plants using molecular and genomics tools. Cereals and grain crops. Godwin, Ian D. Good enough to eat? : Next generation GM crops. Cambridge, United Kingdom: Royal Society of Chemistry, 2019. Liu, Guoquan, Gilding, Edward and Godwin, Ian D. (2014). Genetic Transformation and Breeding. In Yi-Hong Wang and Chittaranjan Kole (Ed. ), Genetics, Genomics and Breeding of Sorghum (pp. 251-283) Boca Raton: CRC Press. Mace, E. S., Mathur, P. N., Godwin, I. D., Hunter, D., Taylor, M. B., Singh, D., DeLacy, I. H. and Jackson, G. V. H. (2010). Development of a regional core collection (Oceania) for taro, Colocasia esculenta (L.) Schott, based on molecular and phenotypic characterization. In V. Ramanatha Rao, P. J. Matthews, P. B. Eyzaguirre and D. Hunter (Ed. ), The Global Diversity of Taro: Ethnobotany and Conservation (pp. 185-201) Rome, Italy: Bioversity International. Lambrides, C. J., Rebetzke, G. J., Laidlaw, H. K. C. and Godwin, I. D. (2008). Molecular breeding in abiotic stress resistance. In Chittaranjan Kole and Albert G. Abbott (Ed. ), Principles and practices of plant genomics (pp. 165-215) Enfield, USA: Science Publishers. Laidlaw, Hunter K. C. and Godwin, Ian D. (2008). Sorghum. In Chittaranjan Kole and Timothy. C. Hall (Ed. ), Compendium of transgenic crop plants: Transgenic cereals and forage grasses (pp. 157-175) Chichester, U.K.: Blackwell Publishing. Lambrides, C. J. and Godwin, I. D. (2007). Mungbean. In Chittaranjan Kole (Ed. ), Pulses, Sugar and Tuber Crops (pp. 69-90) Berlin: Springer-Verlag. Gray, S., Zhang, S., Rathus, C. O., Lemaux, P. and Godwin, I. D. (2004). Development of sorghum transformation: organogenic regeneration and gene transfer methods. In N. Seetharana and I. Godwin (Ed. ), Sorghum Tissue Culture & Transformation 1 ed. (pp. 35-44) Enfield (NH), USA: Science Publishers Inc. Able, J. A., Rathus, C. O., Carroll, B. J. and Godwin, I. D. (2004). Enhancing transgene expression levels in sorghum: Current status and future goals. In N. Seetharana and Ian Godwin (Ed. ), Sorghum Tissue Culture and Transformation (pp. 85-96) Enfield, NH, U.S.A.: Science Publishers. Reddy, B. V., Seetharama, N. and Godwin, I. (2004). Integrating traditional breeding and transgenic research methods in sorghum improvement. In N. Seetharama and Ian Godwin (Ed. ), Sorghum Tissue Culture and Transformation (pp. 145-151) Enfield, United States: Taylor & Francis. Rathus, C. O., Nguyen, T., Able, J., Gray, S. and Godwin, I. D. (2004). Optimizing sorghum transformation technology via somatic embryogenesis. In N. Seetharama and I. Godwin (Ed. ), Sorghum Tissue Culture & Transformation 1 ed. (pp. 25-34) Enfield (NH), USA: Science Publishers, Inc.
Williams, S. B., Gray, S., Laidlaw, H. K. C. and Godwin, I. D. (2004). Particle inflow gun-mediated transformation of sorghum bicolor. In I.S. Curtis (Ed. ), Transgenic Crops of the World - Essential Protocols 1 ed. (pp. 89-102) Dordrecht: Kluwer Academic Publishers. Godwin, I. D. (2004). Sorghum genetic engineering: Current status and prospects. In Seetharama, N. and Godwin, Ian (Ed. ), Sorghum Tissue Culture and Transformation (pp. 1-8) Enfield, NH, United States: Science Publishers. Godwin, I. D. (2004). Sorghum genetic engineering: current status and prospects. In N. Seetharama and I. Godwin (Ed. ), Sorghum Tissue Culture & Transformation 1 ed. (pp. 1-8) Enfield (NH), USA: Science Publishers Inc.
Godwin, I. D., Mace, E. and Nurzuhairawaty, (2001). Genotyping Pacific Island taro (Colocasia esculenta (L.) Schott) germplasm. In R.J. Henry (Ed. ), Plant Genotyping: The DNA Fingerprinting of Plants (pp. 109-128) Oxon, UK: CABI Publishing. Rathus, C. O. and Godwin, I. D. (2000). Transgenic sorghum (Sorghum bicolor). In Y. P. S. Bajaj (Ed. ), Biotechnology in Agriculture and Forestry (pp. 76-83) Heidelberg: Springer-Verlag. Adkins, S. W., Samosir, Y. and Godwin, I. D. (1999). Control of environmental conditions and the use of polyamines can optimise the conditions for the initiation and proliferation of coconut somatic embryos. In C. Oropeza, J. L. Verdeil, G. R. Ashburner, R. Cardena and J. M. Santamaria (Ed. ), Current Advances in Coconut Biotechnology (pp. 321-338) Dordrecht, Netherlands: Kluwer Academic Publishers. Samosir, Y., Godwin, I. D. and Adkins, S. W. (1999). The use of osmotically active agents and abscisic acid can optimise the maturation of coconut somatic embryos. In C. Oropeza, J. L. Verdeil, G. R. Ashburner, R. Cardena and J. M. Santamaria (Ed. ), Current Advances in Coconut Biotechnology (pp. 341-354) Dordrecht, Netherlands: Kluwer Academic Publishers. Okpul, T., Mace, E. S., Godwin, I. D., Singh, D. and Wagih, M. E. (2005) Evaluation of Variability Among Breeding Lines and Cultivars of Taro (Colocasia Esculenta) in Papua New Guinea Using ISSR Fingerprinting and Agro-Morphological Characterization. Plant Genetic Resources Newsletter, 143: 8-16. Okpul, T., Mace, E., Godwin, I. D., Singh, D. and Wagih, M.E. (2005) Evaluation of variability among breeding lines and cultivars of taro (Colocasia esculenta) in Papua New Guinea using ISSR fingerprinting and agro-morphological characterization. Plant Genetic Resources Newsletter, 143 8-16. Ernawati, A., Drew, R.A., Adkins, S. W. and Godwin, I. D. (2004) Production of seedling of Carica papaya L. by Carica parviplora (A.DC) solms. interspecific hybrids using embryo rescue. Buletin Agronomi, 32 1: 39-43. Mace, E. and Godwin, I. D. (2000) Documenting the genetic diversity of taro with microsatellites. The Satellite, 3 1: 4-6. Able, J. and Godwin, I. D. (2000) Enhancing transgene expression in plants: A role for matrix attachment regions (MARs). Current Topics in Plant Biology, 2 117-124. Ernawati, A., Adkins, S. W., Drew, R. A. and Godwin, I. D. (1999) Initiation and proliferation of Papaya (Carica papaya L.) somatic embryos from zygotic tissue. Buletin Agronomi, 27 3: 15-22. An efficient interspecific hybridisation protocol for Carica papaya LxC cauliflora Jacq. Damasco, OF, Godwin, ID, Smith, MK and Adkins, SW (1996) Gibberellic acid detection of dwarf offtypes in micropropagated Cavendish bananas (vol 36, pg 237, 1996). AUSTRALIAN JOURNAL OF EXPERIMENTAL AGRICULTURE, 36 6: 237-241. Callus culture-derived somaclonal variation in the tropical pasture legume Stylosanthes guianensis (Aubl.) Sw.
Plant regeneration from leaf-derived callus cultures of the tropical pasture legume Stylosanthes scabra Vog. Gray, SJ, Zhang, S, Rathus, C, Lemaux, PG and Godwin, ID () Development of sorghum transformation: Organogenic regeneration and gene transfer methods. SORGHUM TISSUE CULTURE AND TRANSFORMATION, 35-43. Rathus, C, Nguyen, T, Able, JA, Gray, SJ and Godwin, ID () Optimizing sorghum transformation technology via somatic embryogenesis. SORGHUM TISSUE CULTURE AND TRANSFORMATION, 25-34. Dinglasan, E., Singh, D., Godwin, I. and Hickey, L. (2017). Understanding the genetic control of quantitative resistance to yellow spot in wheat. In: Annual Meeting the American-Phytopathological-Society (APS), San Antonio TX, United States, (S5.68). 05-09 August 2017. Lambrides, Christopher J., Zhou, Yi, Fukai, Shu, Jewell, Margaret, Loch, Don, Godwin, Ian, Holton, Tim, Innes, David, Frere, Celine, Hanna, Wayne, Ye, Changrong, Van Tran, Thinh, Le, Thu, Cao, Ninh, Al Dabbagh, Haider, O'Brien, Chris, Roche, Matt, Fullelove, Garry, Ballard, Emma, Kearns, Ryan, Pearce, Will, Hacker, Andrew, Puachuay, Meena, Shelton, Max, Dalzell, Scott, Anderson, Bill, Harris-Shultz, Karen and Cremer, Julia (2013). Ecoturf - a case study on genetic variation and agronomic potential of bermudagrass (cynodon spp.) germplasm collected from Australian biodiversity. In: Research Papers presented at the 10th International Turfgrass Research Conference. ITRC 2013: 12th International Turfgrass Research Conference, Beijing, China, (263-266). 14-19 July 2013. Hacker, Andrew, Puachuay, Meena, Shelton, H. Max, Dalzell, Scott, Al Dabbagh, Haider, Jewell, Margaret, Tran, Thinh Van, Ngo, The, Zhou, Yi, Halliday, Michael, Giles, Hayley, Loch, Don S., Godwin, Ian D., Fukai, Shu, O'Brien, Chris, Pearce, Will, Anderson, William F. and Lambrides, Christopher J. (2013). Potential of Australian bermudagrasses (Cynodon spp.) for pasture in subtropical Australia. In: IGC 2013 Poster Papers. IGC2013: 22nd International Grassland Congress 2013, Sydney, NSW, Australia, (81-83). 15-19 September, 2013. Zhou, Yi, Fukai, Shu, Loch, Donald S., Godwin, Ian D. and Lambrides, Christopher J. (2013). Selection for tolerance to both drought and frost among a large number of bermudagrass (Cynodon spp.) ecotypes collected from different climatic zones. In: Research Papers presented at the 10th International Turfgrass Research Conference. ITRC 2013: 12th International Turfgrass Research Conference, Beijing, China, (795-800). 14-19 July, 2013. Lomas, Victoria, Guru, Preethi, Campbell, Bradley, Loo, Dorothy, Hill, Michelle, Godwin, Ian and Davies, Janet (2012). Novel pollen allergens of the subtropical Johnson grass (sorghum Halepense) that are important for allergic respiratory disease. In: Special Issue: Australasian Society of Clinical Immunology and Allergy (ASCIA) 23rd Annual Scientific Meeting. Australasian Society of Clinical Immunology and Allergy (ASCIA) 23rd Annual Scientific Meeting, Wellington, New Zealand, (7-8). 5–8 September 2012. Li, Enpeng, Hasjim, Jovin, Singh, Vijaya, Tizzotti, Morgan, Godwin, Ian D. and Gilbert, Robert G. (2011). Effects of high growing temperature on starch structure in sorghum grains. In: American Association of Cereal Chemists (AACC) International Conference, Palm Springs, CA, United States, (). 16-19 October 2011. Li, Enpeng, Hasjim, Jovin, Dhital, Sushil, Godwin, Ian D. and Gilbert, Robert G. (2011). Gibberellin-biosynthesis inhibitor treatment on sorghum plants does not affect the structural properties of the starch. In: Institute of Food Technologists Annual Meeting, New Orleans, LA, USA, (). 11-14 June 2011. Li, Enpeng, Hasjim, Jovin, Singh, Vijaya, Tizzotti, Morgan, Godwin, Ian D. and Gilbert, Robert G. (2011). The effects of high growing-temperature on the structure of sorghum starch. In: 61st Australian Cereal Chemistry Conference, Coolongatta, NSW, Australia, (). 4-8 September 2011. Li, Enpeng, Hasjim, Jovin, Dhital, Sushil, Godwin, Ian D and Gilbert, Robert G (2011). The effects of trinexapac-ethyl treatment on the physicochemical properties of sorghum starch. In: Australian Food Science Summer School, Brisbane, Australia, (). 9-11 February 2011. Kearns, R., Zhou, Yi, Fukai, Shu, Ye, Changrong, Loch, D., Godwin, I., Holton, T., Innes, D., Stirling, H., Cao, Ninh, Jewell, M., Duff, A. and Lambrides, C. (2010). Eco-turf: Water use efficient turfgrasses from Australian biodiversity. In: Geijskes, RJ, Lakshmanan, P and Taji, A, Proceedings of the VIth International Symposium on In Vitro Culture and Horticultural Breeding. VIth International Symposium on In Vitro Culture and Horticultural Breeding, Brisbane, QLD, Australia, (113-118). 24-28 August, 2008. Ye, C., Fukai, S., Godwin, I., Reinke, R., Snell, P. and Koh, H. (2009). Identifying genetic resources and QTL for cold tolerance in rice. In: Edilberto Redona, Proceedings of the Joint 14th Australasian Plant Breeding Conference and 11th SABRAO Congress. 14th Australasian Plant Breeding Conference (APBC) and the 11th Congress of the Society for the Advancement of Breeding Research in Asia and Oceania (SABRAO), Cairns, Australia, (1-7). 10-14 August 2009. Zhou, Y., Fukai, S., Cao, N., Ye, C. R., Le, T., Loch, D., Godwin, I., O'Brien, C., Dunne, R., Giles, H., Wilson, M., Halliday, M. and Lambrides, C. (2009). The use of infrared thermometer to detect drought resistance of green couch grass (Cynodon sp.) genotypes collected from the world'd driest inhabited continent. In: The 3rd International Conference on Integrated Approaches to Improve Crop Production Under Drought Prone Environments, Shanghai China, (). 11-16 October 2009. DeLacy, Ian H., Arief, Vivi N., Dieters, Mark J., Crossa, Jose, Godwin, Ian, Batley, Jacqueline, Davenport, Guy, Dreisiqacker, Susane, Edwards, Dave, Huttner, Eric, Lambrides, Christopher, Manes, Yan, Payne, Thomas, Singh, Ravi P., Warburton, Marilyn, Wenzl, Peter, William, Manilal, Kilian, Andrzej, McLaren, Graham, Crouch, Jonathan and Basford, Kaye E. (2008). A comparison of three genotype structures for 686 lines derived from pedigrees (COP), 1400 DArT markers and 420,000 data points from 25 Years of CIMMYT international bread wheat trials. In: Plant & Animal Genome XVI Conference Abstracts. Plant and Animal Genome XVI Conference, San Diego, CA, U.S.A., (). 12-16 January 2008. Dieters, M. J., Crossa, J., Godwin, I. D., Batley, J., Davenport, G., Dreisigacker, S., Edwards, D., Huttner, E., Lambrides, C. J., Manes, Y., Payne, T., Singh, R. P., Duveiller, E., Warburton, M., Wenzl, P., Kilian, A., McLaren, G., Braun, H-J., Crouch, J., Ortiz, R. and Basford, K. E. (2008). A wheat phenome atlas and phenome atlas toolbox. In: ASC2008: Australian Statistics Conference, Melbourne, Vic, Australia, (). 30 June - 3 July, 2008. Arief, Vivi N., DeLacy, Ian H., Dieters, Mark J., Crossa, Jose, Godwin, Ian, Batley, Jacqueline, Davenport, Guy, Dreisiqacker, Susane, Edwards, Dave, Huttner, Eric, Lambrides, Christopher, Manes, Yan, Payne, Thomas, Singh, Ravi P., Warburton, Marilyn, Wenzl, Peter, Williams, Manila, Kilian, Andrezj, McLaren, Graham, Crouch, Jonathan and Basford, Kaye E. (2008). Association between phenotype and DArT markers in spring wheat using 25 years Of CIMMYT international field trial data. In: Plant & Animal Genome XVI Conference Abstracts. Plant & Animal Genomes XVI Conference, San Diego, USA, (). 12-16 January 2008. Godwin, I., Jordan, D. and Shewayrga, H. (2008). Changing genetic diversity in Ethiopian sorghums: Risk averse farmer response to climate change. In: 5th International Crop Science Congress, Jeju, Korea, (). 13-18 April 2008. Godwin, Ian D., DeLacy, Ian H., Arief, Vivi N., Dieters, Mark J., Lambrides, Christopher J., Basford, Kaye E., Crossa, Jose, Dreisigacker, Susanne, Kilian, Andrzej, Huttner, Eric, Crouch, Jonathan and McLaren, Graham (2008). Developing the wheat phenome atlas: Integrating 25 years of international wheat phenotypic data with genome analysis. In: 5th International Crop Science Conferences, Jeju, South Korea, (). 13-18 April, 2008. Arief, Vivi N., DeLacy, Ian H., Dieters, Mark J., Crossa, Jose, Godwin, Ian D., Batley, Jacqueline, Davenport, Guy, Dreisigacker, Susanne, Duvieller, Etienne, Edwards, D., Huttner, E., Lambrides, C., Manes, Y., Payne, T., Singh, R. P., Warburton, Marilyn, Wenzl, Peter, Kilian, Andrzej, McLaren, Graham, Braun, Hans-J., Crouch, Jonathan, Ortiz, Rodomiro and Basford, Kaye E. (2008). Marker/trait associations identified in spring wheat using 25 years of CIMMYT International Trials. In: R. Appels, R. Eastwood, E. Lagudah, P. Langridge, M. Mackay, L. McIntyre and P. Sharp, Proceedings of the 11th International Wheat Genetics Symposium. 11th International Wheat Genetics Symposium, Brisbane, Queensland, (O27-O27). 24-29 August 2008. Ye, Changrong, Fukai, Shu, Reinke, Russell, Godwin, Ian, Snell, Peter and Basnayake, Jaya (2008). Screening rice genetic resources for cold tolerance at different growth stages. In: Unkovich, M, Global Issues, Paddock Action: Proceedings of the 14th Australian Society of Agronomy Conference. 14th Australian Society of Agronomy Conference, Adelaide, South Australia, (). 21-25 September 2008. Towards a wheat phenome atlas and a phenome atlas toolbox: What are they? What progress? DeLacy, Ian H., Dieters, Mark J., Crossa, Jose, Godwin, Ian D., Arief, Vivi N., Batley, Jacqueline, Davenport, Guy, Dreisigacker, Susanne, Edwards, David, Huttner, Eric, Lambrides, Christopher J., Manes, Yann, Payne, Thomas, Singh, Ravi P., Duvieller, Etienne, Warburton, Marilyn, Wenzl, Peter, Kilian, Andrzej, McLaren, Graham, Braun, Hans-J., Crouch, Jonathan, Ortiz, Rodomiro and Basford, Kaye E. (2008). Towards a wheat phenome atlas and a phenome atlas toolbox: What are they? What progress?. In: Rudi Appels, Russell Eastwood, Evans Lagudah, Peter Langridge and Michael Mackay Lynne, Proceedings of the 11th International Wheat Genetics Symposium. 11th International Wheat Genetics Symposium, Brisbane, Queensland, (). 24-29 August 2008. Desmae, H. S., Godwin, I. D., Grenier, C., Ejeta, G., Jordan, D. and Gebrekidan, B. (2006). Changing genetic diversity of sorghum landraces of North-Eastern Ethiopia. In: A.K. Borrell, R.G. Henzell and D.R. Jordan, Proceedings of the 5th Australian Sorghum Conference. 5th Australian Sorghum Conference, Gold Coast, QLD, Australia, (1-7). 30 January - 2 February 2006. Pandit, P. S., Laidlaw, H. K. C., Williams, S. B. and Godwin, I D (2006). Characterisation and manipulation of sorghum kafirins. In: A.K. Borrell and R.G. Henzell and D.R. Jordan, Proceedings of the 5th Australian Sorghum Conference. 5th Australian Sorghum Conference, Gold Coast, (1-4). 30 January - 2 February 2006. Parh, D. K., Jordan, D., Aitken, E A B, McIntyre, and Godwin, I D (2006). Genetics of ergot resistance in sorghum. In: A.K. Borrell and R.G. Henzell and D.R. Jordan, Proceedings of the 5th Austgralian Sorghum Conference. 5th Australian Sorghum Conference, Gold Coast, (1-7). 30 January - 2 February, 2006. Ritter, K., Chapman, S. C., Jordan, D., Godwin, I. D. and McIntyre, C. L. (2004). Investigating the use of sweet sorghum as a model for sugar accumulation in sugarcane. In: T. Fischer, New Directions for a Diverse Planet: Proceedings of the 4th International Crop Science Congress. 4th International Crop Science Congress (4ICSC), Brisbane, Australia, (1-5). 26 September-1 October 2004. Parh, D. K., Jordon, D., Aitken, E. A. B., McIntyre, L. and Godwin, I. D. (2004). Sorghum ergot: revealing the genetic architecture of resistance. In: T. Fischer, Proceedings of the 4th International Crop Sciences Congress. New Directions for a Diverse Planet: 4th International Crop Sciences Congress, Brisbane Australia, (1-4). 26 September -1 Oct ober. Brumbley, S. M., Godwin, I., Hermann, S., Smith, G. R. and Williams, S. (2003). Activity of three sorghum pathogenesis related class 10 protein gene promoters. In: ICCP 2003: 8th International Congress of Plant Pathology. 8th International Congress of Plant Pathology: Solving Problems in the Real World, Christchurch Convention Centre, New Zealand, (195-195). 2 - 7 February 2003. Brumbley, S. M., Casu, R. E., Drenth, J., Godwin, I. D., Hermann, S. R., Knight, D., Manners, J. M., Mcintyre, C. L, Smith, G. R., Tao, Y. and Williams, S. B. (2003). Towards a better understanding of disease resistance in sugarcane and sorghum. In: 4th ISSCT Molecular Biology Workshop - Genome Analysis and Molecular Physiology, Montpelier, France, (). 7- 4 April 2003. Parh, D., Jordan, D., Aitken, E. A. B., McIntyre, L. and Godwin, I. D. (2002). Association of pollen traits with ergot resistance in Sorghum (Sorghum bicolor). In: J.A. McComb, Proceedings of the 12th Australasian Plant Breeding Conference. Plant Breeding for the 11th Millennium, Perth, W.A./Hyatt Regency Perth, (424-426). 15-20 September, 2002. Singh, D., Mace, E., Okpul, T., Godwin, I. D., Mathur, P., Taylor, M.B., Kambuou, R., Ramanatha Rao, V. and Hunter, D. (2002). Collection, characterization and conservation of taro (Colocasia esculenta) genetic resources for efficient utilization in breeding. In: J.A. McComb, Plant breeding for the 11th millenium : proceedings of the 12th Australasian Plant Breeding Conference. 12th Australasian Plant Breeding Conference, Perth, Western Australia, (251-253). 15-20 September, 2002. Laidlaw, H. K. C., Persley, D., Pallaghy, C. K. and Godwin, I. D. (2002). Development of durable transgenic johnsongrass mosaic virus resistance in sorghum. In: ComBio 2002. Combined Conference Abstracts. ComBio 2002, Sydney/Sydney Convention Centre, (). 30 September - 3 October 2002. Zwart, R., Donkin, C., Thompson, J. and Godwin, I. D. (2002). Exploiting synthetic hexaploid wheats as sources of multiple disease resistance. In: J.A. McComb, Proceedings of the 12th Australasian Plant Breeding Conference. Plant Breeding for the 11th Millennium, Perth, W.A./Hyatt Regency Perth, (437-439). 15-20 September, 2002. Gray, S., Izquierdo, L., Lemaux, P., Buchanan, B. and Godwin, I. D. (2002). Improving sorghum grain quality via genetic engineering. In: J. A. McComb, Plant breeding for the 11th millenium : proceedings of the 12th Australasian Plant Breeding Conference. 12th Australasian Plant Breeding Conference, Perth, Western Australia, (66-68). 15-20 September, 2002. Williams, S. B., Hermann, S., Brumbley, S., Smith, G. and Godwin, I. D. (2002). Novel genes for resistance to pathogens and pests in sorghum and sugarcane. In: ComBio 2002. Combined Conference Final Program. ComBio 2002, Sydney, (POS-MON-128-POS-MON-128). 29 September - 3 October, 2002. Chigeza, G., Tembo, E., Pixley, K., Mwsaka, R., Delacy, I. H. and Godwin, I. D. (2002). Quantifying the relationship between heterosis and genetic distance for Gray Leaf Spot resistance in eight sub-tropical elite maize inbred lines using simple sequence repeats. In: J.A. McComb, Proceedings of the 12th Australasian Plant Breeding Conference. Plant Breeding for the 11th Millennium, Perth, W.A./Hyatt Regency Perth, (298-302). 15-20 September, 2002. Godwin, I. D., Zhang, S., Cho, M-J., Bregitzer, P. and Lemaux, P. (2002). Retrotransposons and cereal genome instability: barley and the rampant BARE-1 element. In: J.A. McComb, Proceedings of the 12th Australasian Plant Breeding Conference. Plant Breeding for the 11th Millennium, Perth, W.A./Hyatt Regency Perth, (37-41). 15-20 September, 2002. Izquierdo, L., Gray, S. and Godwin, I. D. (2001). A transgenic approach to improving the digestibility of sorghum grain. In: A.K. Borrell and R.G. Henzell, 4th Australian Sorghum Conference. 4th Australian Sorghum Conference, The Korralbyn Hotel Resort, Queensland, (). 5-8 February, 2001. Mace, E., Godwin, I. D. and Mathur, P. (2001). Core collections and molecular markers. In: AusAID/SPC Taro Genetic Resources: Conservation and Utilisation - Taro Conservation Strategy Workshop Report. AusAID/SPC Taro Genetic Resources: Conservation & Utilisation, Suva, Fiji, (14-18). October, 2001. Zwart, R. S., Thompson, J. P. and Godwin, I. D. (2001). Development of molecular markers to root-lesion nematodes in multiple disease resistant wheat. In: Australasian Plant Pathology Society - 13th Biennial Conference: Conference Handbook. 13th Biennial Conference: Australasian Plant Pathology Society, Cairns, Queensland, (306-306). 24-27 September, 2001. Mace, E., Godwin, I. D. and Mathur, P. (2001). Development of recommended taro core collection based on molecular characterisation. In: AusAID/SPC Taro Genetic Resources: Conservation and Utilisation - Taro Conservation Strategy Workshop Report, September 2001. AusAID/SPC Taro Genetic Resources: Conservation & Utilisation, Suva, Fiji, (19-24). October, 2001. Gray, S., Izquierdo, L. and Godwin, I. D. (2001). GM sorghum: A new generation of designer crops. In: A.K. Borrell and R.G. Henzell, 4th Australian Sorghum Conference. 4th Australian Sorghum Conference, The Korralbyn Hotel Resort, Queensland, (). 5-8 February, 2001. Zwart, R. S., Thompson, J. P. and Godwin, I. D. (2001). Inheritance of root-lesion nematode (Pratylenchus thornei) resistance in synthestic hexaploid wheat. In: R. Eastwood, G. Hollamby and T. Rathjen and N. Gororo, Wheat Breeding Society of Australia Inc - 10th Assembly Proceedings. 10th Assembly of Wheat Breeding Society of Australia, Mildura, Australia, (60-62). 16-21 September, 2001. Gray, S., Izquierdo, L., Rathus, C. O. and Godwin, I. D. (2001). Particle inflow gun-mediated transformation of sorghum for insect resistance. In: A.K. Borrell and R.G. Henzell, 4th Australian Sorghum Conference. 4th Australian Sorghum Conference, The Korralbyn Hotel Resort, Queensland, (). 5-8 February, 2001. Godwin, I. D., Gray, S. J., Rathus, C. O. and Izquierdo, L. (2000). Genetic engineering of sorghum for stem borer resistance. In: 6th International Congress of Plant Moledular Biology: Book of Abstracts. 6th International Congress of Plant Molecular Biology, Quebec, Canada, (S03-41). 18-24 June, 2000. Godwin, I. D. and Gray, S. J. (2000). Overcoming productivity and quality constraints in sorghum: the role for genetic engineering. In: L. O'Brien and R.J. Henry, Transgenic Cereals. Symposium on Transgenic Cereals, Gold Coast, Queensland, (153-177). September, 2000. Able, J., Rathus, C. O. and Godwin, I. D. (2000). The maize Ds element excises in transgenic sorghum. In: 6th International Congress of Plant Molecular Biology; Book of Abstracts. 6th International Congress of Plant Molecular Biology, Quebec, Canada, (S03-3). 18-24 June, 2000. Zwart, R. S., Thompson, J. P., Godwin, I. D., Brennan, P. S., Sheedy, J. G. and Mason, L. (1999). Diallel analysis of resistance to root-lesion nematode (Pratylenchus thornei) in synthetic hexaploid and common wheat. In: P. Williamson, P. Banks, I. Haak, J. Thompson and A. Campbell, 9th Assembly Wheat Breeding Society of Australia. 9th Assembly Wheat Breeding Society of Australia, Toowoomba, (75-78). 27 September - 1 October 1999. Able, J. A., Carroll, B. J., Rathus, C. O. and Godwin, I. D. (1999). Excision of a maize Ds element in sorghum. In: Combined Conference Abstracts - 43rd Annual ASBMB, 18th ANZSCDB and 39th Annual ASPP. 43rd Annual ASBMB, 18th ANZSCDB and 39th ASPP Ann Combined Meeting, Conrad Jupiters, Gold Coast, Qld, (Pos-Mon-27). 27-30 September 1999. Duan, C., Rathus, C. O. and Godwin, I. D. (1999). Expression and patterns of the GUS gene silencing in rice. In: Combined Conference Abstracts: 43rd Annual ASBMB, 18th Annual ANZSCDB and 39th Annual ASPP. 43rd ASBMB, 18th ANZSCDB & 39th ASPP Annual Combined Conference, Conrad Jupiters, Gold Coast, Qld, (Pos-Mon-26). 27-30 September 1999. MARs to sorghum: Have we landed? Able, J. A., Carroll, B. J., Rathus, C. O. and Godwin, I. D. (1999). MARs to sorghum: Have we landed?. In: Combined Conference Abstracts: 43rd Annual ASBMB, 18th Annual ANZSCDB and 39th Annual ASPP. 43rd ASBMB, 18th ANZSCDB & 39th ASPP Annual Combined Coference, Conrad Jupiters, Gold Coast, Qld, (Pos-Wed-07). 27-30 September 1999. Reyes, M., McDowall, A. W., Ghoddusi, M., Brown, S., Godwin, I. D., Keddie, J. S. and Carroll, B. J. (1999). Molecular and anatomical analysis of cell expansion and differentiation in plants. In: Plant and Animal Genome Conference VII. Plant and Animal Conference VII, Town and Country Hotel, San Diego, California, (90). 17th -21st January, 1999. Able, J. A., Carroll, B. J., Rathus, C. O. and Godwin, I. D. (1999). Sorghum to MARs-Come in Please. In: Plant and Animal Genome Conference VII. Plant and Animal Conference VII, Town and Country Hotel, San Diego, California, (213). 17-21 January, 1999. Waldron, J., Reyes, M., Furtado, A., Klimyuk, V., Wang, J. S., Godwin, I. D., Scott, K. J., Jones, J. D. and Carroll, B. J. (1999). Transposon tagging of chromosomal regions responsible for alleviating transgene silencing. In: HGM'99. Human Genome Meeting, Brisbane Convention Cen., Brisbane, (83). 27th -30th March, 1999. Lawson, W., Kong, G., Engel, B., Goulter, K., Thompson, S., Pike, D., Godwin, I. D. and Kochman, J. (1999). Using biotechnology to help improve sunflower rust resistance. In: Proceedings 21st Sunflower Research Workshop. 21st Sunflower Research Workshop, Fargo, North Dakota, USA, (41-45). 14-15 January 1999. The effect of exogenous polyamines on somatic embryogenesis and plant regeneration from Sorghum bicolor and Saccharum spp. Godwin, I. D. and Chickwamba, R. (1994). Transgenic grain sorghum (Sorghum bicolor) plants via Agrobacterium. In: John A. Ronalds and Robert Henry James, Improvement of cereal quality by genetic engineering. Royal Australian Chemical Institute, Cereal Chemistry Division Symposium on Improvement of Cereal Quality by Genetic Engineering, Sydney, NSW, Australia, (47-53). 12-16 September 1993. Developing a foundation for the long-term management of basal stem rot of oil palm in Papua New Guinea and the Solomon Islands. Downregulation of Cyanide Production in Sorghum Via Genetic Engineering. Attendance at the Plant and Animal Genome VI conference in San Diego, USA, January 1998. Containment glasshouse for genetically engineered plants (PH1). Canopy Manipulation of Sorghum to create a more efficient, stress tolerant plant with increased yield. MARKER CHARACTERISATION AND VALIDATION IN BREEDING PROGRAMS FOR RUST RESISTANCE IN SUNFLOWERS, Helianthis annuus l.